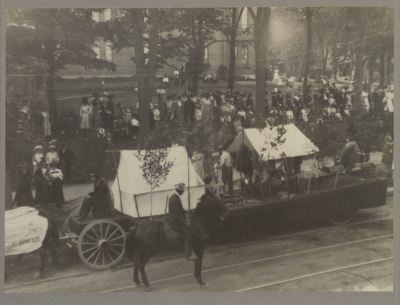 "Adams Dry Goods Co. Bangor Carnival Parade Float, June 18, 1912"
"There was always loud applause when the float of Adams Dry Goods Co. passed by, for it struck deep to the hearts and inclinations of the vast majority of the spectators. The float was drawn by a spanking team and represented a camping scene. Drawn up at the bend of the imaginary stream and turned over was the canoe, with rods leaning against its side. A tent stood ready for occupancy, before it a fire blazed and real water boiled in a kettle (not of birch bark) while scattered about the camping ground were various implements of an outing trip. Variously distributed were the campers, rugged guides and sportsmen a trifle more fastidious perhaps. It was a scene to stir the most sluggish heart into longing for the forest and its waterways." Adams Dry Goods Co., a wholesale dry goods store, operated at 93 Main Street. Edward R. Adams served as treasurer and general manager. Albert R. Day served as company president. On page 29 of the 1912 Bangor city directory, the company is described as "jobbers of dry and fancy goods, furnishing goods, and lumbermen's supplies."